Injected your brisket with the most trusted injection on the market. Our Reserve Blend Brisket injection is more than and injection and marinade. 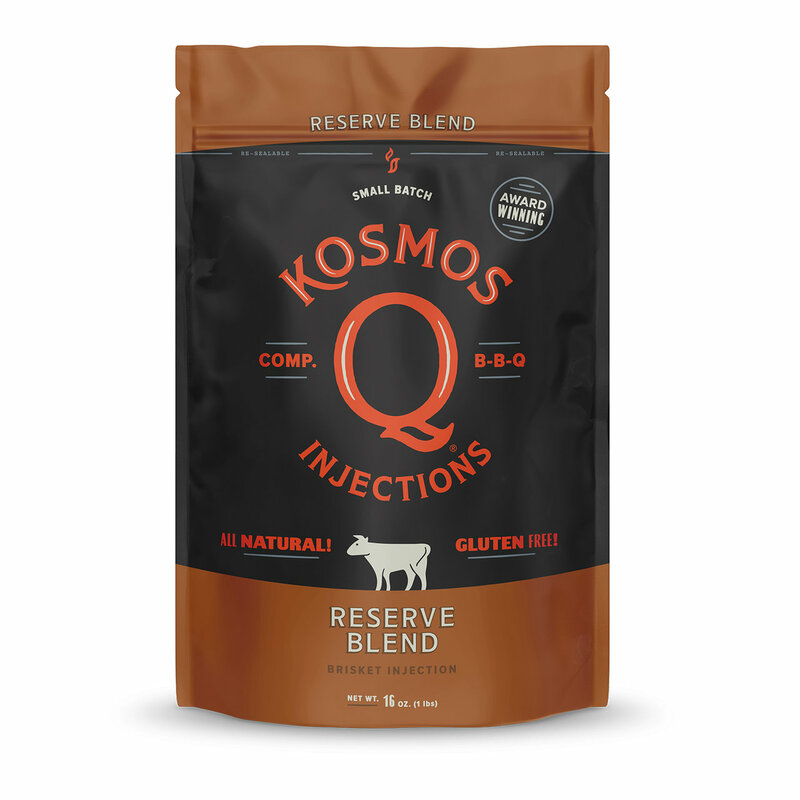 With thousands of hours of testing and winning brisket competitions world wide kosmo's Q reserve blend injection not only win hearts and mouths, but money too. With a succulent synthesis of signature spices and moisture-retaining components, combined with slight smoky flavoring and dehydrated beef stock, you can count on producing a mouth watering tender brisket worthy of even the most seasoned (pun intended) BBQ pitmaster. To truly win a judge's affections, you need Kosmo's Q's meat Injection! So if you are looking for the best brisket injection on the market, you found it. Mix 1/3 cup of product to 2 cups liquid (beef broth, distilled water, or whatever liquid you prefer). Adjust to personal taste as needed. (Enough for 14 lbs. beef). INGREDIENT STATEMENT: Sodium Phosphate (40.0%), Hydrolyzed Soy Protein, Beef Flavoring (Beef Stock, Beef Flavor, Salt), Salt, Autolyzed Yeast, Onion & Garlic Powder, Sugar, Disodium Inosinate & Disodium Guanylate, Xanthan Gum, Spice. Contains: Soy.